For your consideration the most iconic ultra luxury vehicle made prior to World War II, a true mechanical masterpiece to marvel, the Rolls Royce Phantom III. The first of its kind in a class of its own, the only V12 Rolls-Royce to be produced up until the late 90’s. The 7.3-litre all-alloy V12 was based on a design used for Schneider Trophy-winning planes. A lot of Phantom III’s were stripped of their V12 engines and fitted with a simpler V8 and straight sixes, but really where is the fun in that? This Phantom has the original V12, mated to a four-speed manual gearbox (complete with synchromesh on second, third and fourth), enabling a 100mph top speed in its hay day. The engine is not original to the car however it is an original V12 Phantom III engine. Starting with the exterior, a rarely Kneeling Spirit of Ecstasy Lady graces the bonnet of this classic Rolls. A lower version of the Rolls Royce mascot was made to suit the needs of the new sports saloons by providing their drivers with a clearer view of the road ahead, hence her kneeling posture. This version was, however, discontinued, in favor of a smaller version of the original standing mascot, and so it remains to date. This machine was so masterfully designed that every aspect of the car seems to serve a deeper purpose, take the front grille for example, designed as a functional unit made of polished nickel-steel, with the vertical vanes hinged at the top and bottom so they could be opened or closed for better cooling. A beautiful and well executed Pantheon grille trademarked by Rolls Royce in 1974. It is said that the early Pantheon grille’s were built by hand and lined up by eye by a craftsman who would inscribe his initials on it so that, in case of damage, it could be repaired by the man who knows it best. 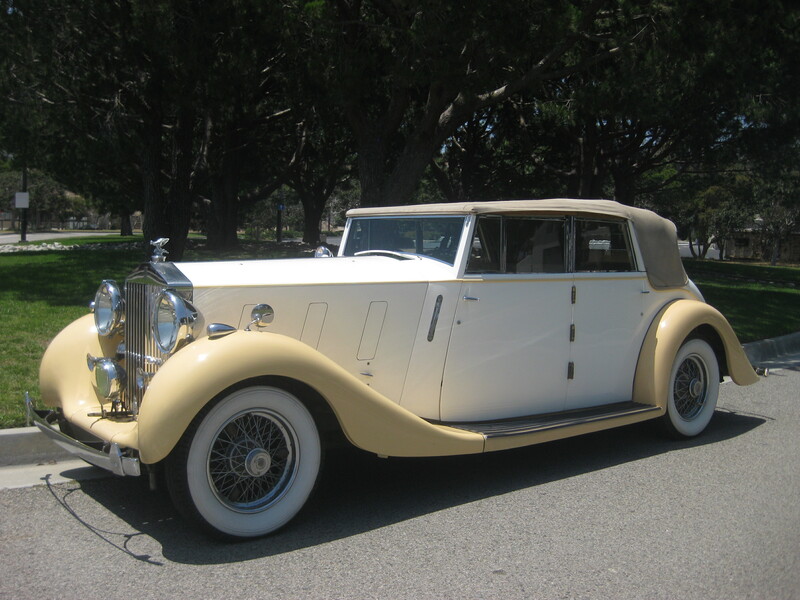 The exterior of this Rolls Royce is a lovely cream color with canary yellow trim, and a tan convertible top.The rear end has been touched up with matching paint and looks great. There is some minor cracking of paint along with the odd chip here and there. This is a Pre war classic after all. 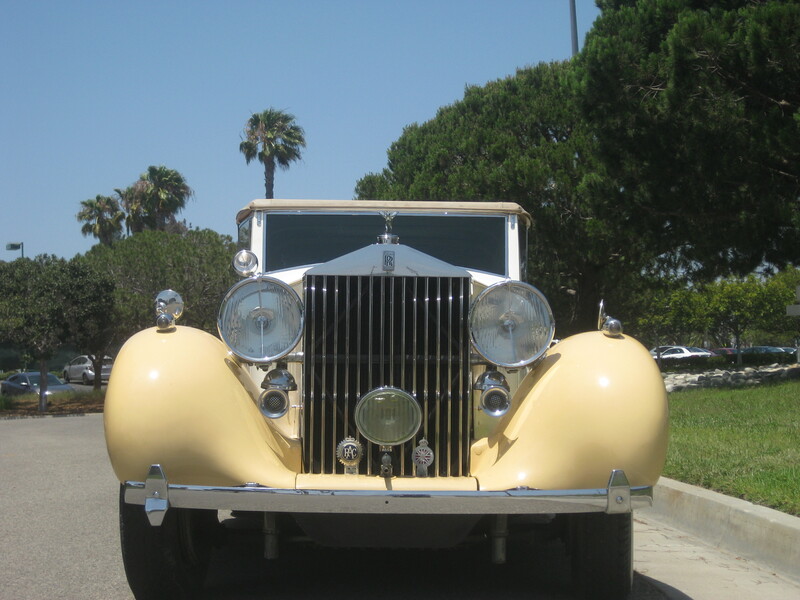 The body of this 1936 Phantom III is in excellent condition, the lines are straight, the fit and gap of all doors are spot on and there is no damage to the body whatsoever. The chrome is in wonderful shape and shines up really nicely. All windows are clear and in exceptional condition as well. The interior of this Phantom III has been mildly refurbished while keeping the integrity and authenticity of this classic in mind. The seats both front and rear have been plumped and recovered with a nice tan leather, and the upholstery has been matched to the seat covers. The dash board is original with amp, temperature, speedometer gauges in working order. There are a few blemishes on the wooden dash that have been tended to. The convertible top has also been re-dyed to match its original color, and looks fantastic inside and out with no tears to be seen. This Phantom runs, drives, and brakes. No easy feat for a car of its magnitude and maturity. The engine fires on all 12 cylinders, and sounds quite healthy. The compression is good and even. The gearbox is in good condition and functions as it should sans first gear synchro. The electrical is all correct and functional inside and out from headlight to tail light. The art of this classic coach can be seen in the little details, the tiny chrome embossed emblem that sit inside the front headlight assemblies, the Coachwork by Barker 66 South Audley Street London England chrome plated on the passenger’s side door sill, the 5 original Rolls Royce Chrome crested octagonal hubs grace 5 white walled tires. Chassis number 3-AZ-74 Rolls Royce London and Derby. 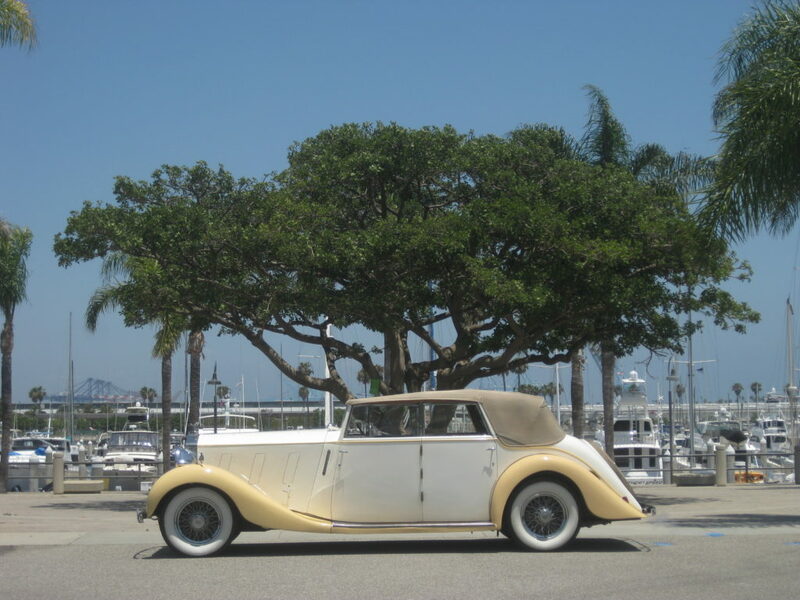 LAST OF THE GREAT PRE-WAR ROLLS-ROYCES! 710 produced between 1936-1939.